Our engagement in and contributions to the communities in which we operate are an important part of sustainability at Pacific Basin. As one of the largest foreign employers of Chinese crew and a significant employer of Filipino crew, we invest in recruitment activities and training programmes in Hong Kong and Dalian (China) and Manila (Philippines) and Odessa. Community donations are focused on the Sailors' Society and Hong Kong Mission to Seafarers. Our Human Resources Director serves as an Asian Ambassador to the Sailors' Society to support seafarer welfare causes. 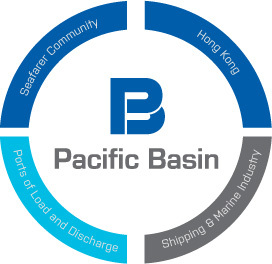 Our ships trade globally and our crew and employees act as ambassadors for Pacific Basin. Officers and crew conduct themselves accordingly as respectful and law-abiding visitors to host ports, showing warm hospitality towards visitors on board. We make every effort to establish and maintain good relations with port authorities and agents and work to exceed requirements under applicable environmental laws to minimise our impact on cities and ports. We take an active role in Hong Kong where we are headquartered, listed and where our owned dry bulk fleet is flagged. We are members of the Hong Kong Shipowners Association executive committee, the Shipping Consultative Committee of the Hong Kong Administration and the Seafarer Advisory Board. Our financial support of maritime causes in Hong Kong includes Pacific Basin's annual three-year scholarship to Hong Kong Polytechnic University for students pursuing a degree in International Transport Logistics. We are active contributors within the shipping community and have a voice in the international dialogue on topical issues and future legislation in our industry.